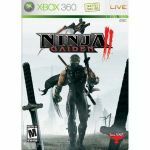 In this action-packed sequel to Ninja Gaiden, you are Ryu Hayabusa, the ultimate ninja hero. Destroy everything in your path as you embark on a quest to avenge your clan and prevent the destruction of the human race from a brutal and relentless enemy. Armed with special moves, deadly weapons and the ruthlessness of a ninja, you shall leave a wake of death in the name of honor.